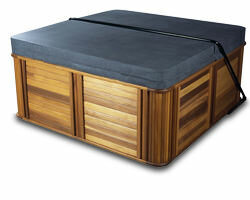 The Cover Guy is one of the original online Hot Tub Cover stores in the UK! 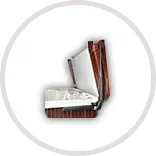 We’ve been Providing custom quality Hot tub Covers and Hot Tub Cover Lifters to go with them at a great price and with great service since 2005. 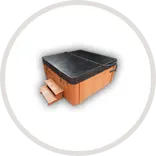 Along with hot tub covers or spa covers and lifters The Cover Guy also provides all hot tub filters, chemicals and accessories for hot tubs and spas. 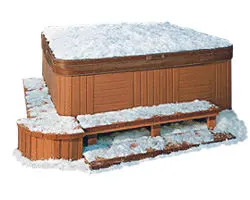 The Deluxe Hot Tub Cover is ideal for most climates, including harsh winter areas, since this cover supports up to 500lbs of static snow weight. We also recommend this cover for families with children or animals. Although we do not recommend you allow children or animals to walk, stand or sit on the cover, the cover is strong enough to hold their weight and won’t cave in if they accidentally fall on the cover. 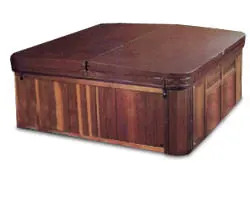 The Cover Guy Extreme 6″ – 4″ tapered hot tub cover is specially designed for the most extreme climates we serve. Built for heavy snow areas, our Extreme covers foam thickness allows rain, ice and snow to runoff off easily. The extreme cover reinforced with over 20 points of internal reinforcement stitching. These stitching points come from our experience in providing over 22,000 hot tub covers a year. No snowfall is a match for our extreme cover!